Splatters iodine all over. Doesn't work well for IC. I probably bought the wrong product. I tried them for cleansing purposes before intermittent catheterization. They are too small for someone with limited hand control to use. When the package is opened, iodine splatters everywhere. They are messy. They do seem to cleanse well. I use these to create a sterile environment when I self cath. 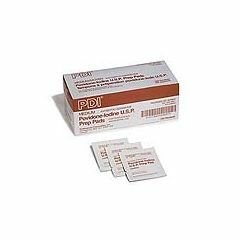 The quantity of Povidone Iodine in these packets is too much to use with the size of the included pads. Makes for a real mess. Others may find this as a plus.